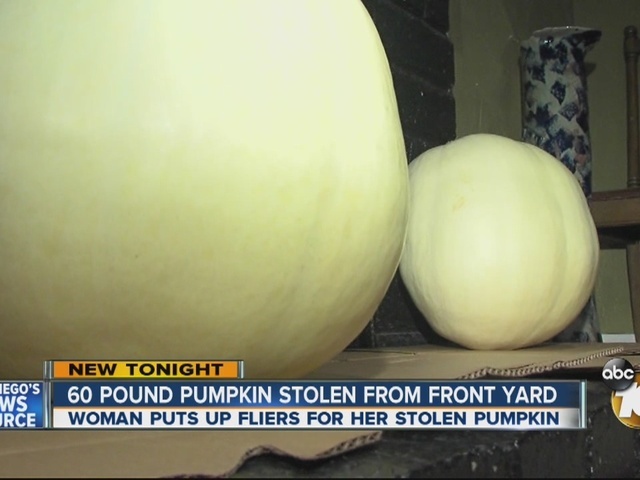 A Rancho Penasquitos woman had her very own "Great Pumpkin," until someone stole it. Grace Flores contacted 10News devastated that someone stole her 60 pound, creamy white pumpkin right out of her front yard Sunday morning. "I just couldn't believe that someone would come in and take that, maybe they didn't realize it was such a personal thing, but here on my property where I've grown pumpkins before," said Flores. She put up fliers all over her neighborhood near Linares Street calling the theft a "wretched violation." Flores said Halloween and pumpkins are a big deal for her family. "It's a big symbol for us for Halloween. My kids and I really enjoy Halloween a lot. We're actually Peanuts fans so the concept of the Great Pumpkin is something that stuck with us as my kids grew up," said Flores. Halloween also happens to be her birthday and she has dozens of ceramic pumpkins that she collects. "It's not a casual thing for me," said Flores. Every year she uses the pumpkins for carving and baking. This year, she was looking forward to carving something special on her giant pumpkin. "I just think someone thought it was a really cool pumpkin, it was huge , it was round, it was gorgeous. It was definitely the pick of the patch, absolutely. I can only hope it's a center piece somewhere,' said Flores. If you have any information about the missing pumpkin, you are asked to call (619) 729-1691.